Recently, virtual reality (VR) has become a hot topic in the education space. This isn’t surprising, considering that the VR revenue forecast is expected to hit $40 billion by 2020, according to market research firm ReportLinker. In addition, augmented and virtual reality offer students a more immersive experience than other technologies currently available. 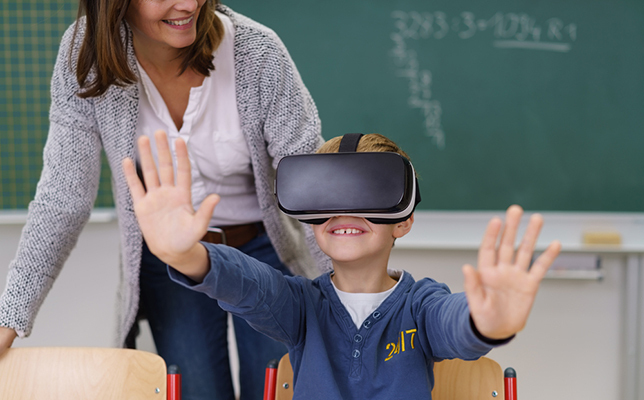 Unfortunately, pricing and other factors can make VR out of reach for some teachers and students, so it’s important to utilize tools that you may already have, like an interactive panel display or a tablet, to bring virtual reality to your classroom. There are also low-cost headsets available. In addition to the ActivPanel board and tablets, my students also use View-Master headsets for individual use. With today’s available technology, it is easy to energize the learning environment by providing students with authentic opportunities to see places and meet people previously unimaginable with virtual field trips. When I started playing around with the idea of virtual field trips, I found several great resources with trips already designed, but none which actually met the state standards by grade level for which I am responsible. I decided to create a custom trip, so that I could take students on a deeper dive in some areas and provide opportunities for student reflection. After evaluating several platform options for hosting trips, I found that I could design exactly what I wanted with ClassFlow, a free online lesson creation and delivery platform. This platform allowed for 360-degree images and video, including interactive polls so I could gather real-time feedback, and even had a tool for annotations by students. We have used the drawing option for highlighting images and collecting students’ favorite features in the trip. Make it an Adventure: Dress the part! For example, when I do a virtual field trip in my classroom, before we start, students line up classroom chairs to create seats for our imaginary bus. Not only does this help manage shared devices during the trip, but it also sets the stage for this virtual field trip. Plan for Interactivity: Using the built-in navigation tools on 360° Images, students can participate in a virtual scavenger hunt on the White House lawn or find a mystery room filled with dishes. Using my online lesson creation and delivery software, students could play “I Spy” as they circled key components in different pictures. While exploring the regions of Texas, students used the text poll option to cite evidence observed that helped them infer rainfall amounts in the area. Include music: When applicable, include music to help set the tone. Studies have shown that when learning new information, students rely heavily on their senses. When presenting new materials, teachers can engage more than one sense to help students create more cognitive connections and associations with a concept. This year, students in our district have visited the White House, taken a whirlwind tour of national landmarks, and even explored the regions of the great state of Texas all without leaving the classroom. From the oohs and aahs heard throughout each experience, you would have thought that the students were really there! There are a number of resources available that you can use. For example, GoogleMaps’s 360° Images can be used to pull specific places you’d like to take your class on a virtual field trip. If you’d like to do more than virtual field trip and instead, learn more about the blood circulation in the heart and lungs for example, content providers like SketchFab offers various free 3D resources that can be used. Truly, the sky is the limit on the places that you can go and the ways in which you can use this tool to enhance student engagement in the classroom. Cindy Wallace is a district STEM coordinator, technology integration specialist, and ACT Math coach. She has been in education for 20 years, and has served as a high school math teacher, campus administrator and district STEM coordinator. Cindy is passionate about engaging students through the use of interactive technologies.